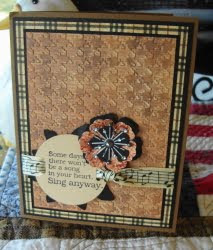 Vada's Blog Stamp Inks and Paper : Houndstooth “Sing Anyway”. 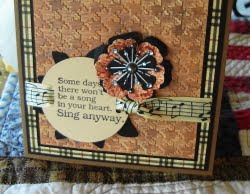 As I said yesterday, I am trying to make a few of these quick cards from Paper Craft Magazine and Card Maker magazine. This is card number two from Paper Craft magazine. With so much interest in Embossing Folder as of late I thought this was way too easy to pass up. I used Sahara Sand Versa Magic chalk ink to darken this plain tan cardstock with a touch of Jumbo Java chalk ink to highlight the cardstock, then embossed it and sanded off some of the color. Thus this faded, weathered look. My die is from Tim Holtz and a Spellbinders die was used. Sing Anyway is from TAC. Printed paper is from Graphic 45, ribbon is from Michaels Dollar Spot. Thanks again, and if I get time tomorrow I’ll post a fabric flower card. Labels: Graphic 45. Paper craft Magazine. Very beautiful Vada! Love the rich colors you used! Can't wait to see the fabric card! well done, love the embossing! one of my fave folders!